Thought Provoking Goal Setting Ideas for ALL! Goal Setting Ideas is here to help you get from concept to completion by providing a complete list of thought provoking ideas. Included in these ideas are goal setting tips, templates, worksheets, and what S.M.A.R.T goal setting is and how to use it. You want to be able to look out to what you want your end result to be and have a written plan on how to work towards it. Ok, now that you've made the decision to write it down, what do you write? Well get that pencil and paper out and no matter how big or small, list it ALL!! Here are a few goal setting ideas to get you rolling. First, decide what it is you want to achieve. Write down all of your dreams and goals and don’t worry about any sort of order yet, you will prioritize them next. If you are not certain what to write, think about it one category at a time. put aside money for a rainy day fund, education, retirement, etc. You get the idea. List them all. For larger goals, break it down into smaller goals that will get you to the end result you desire. 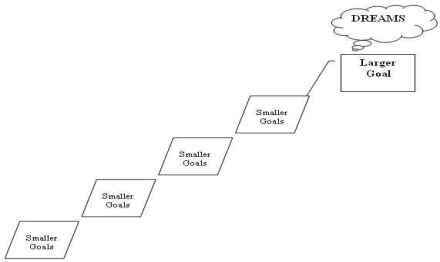 Smaller more immediate goals will get you one step closer to your ultimate goal and will also keep you motivated. With each small accomplishment comes great enthusiasm. For example: Here are some goal setting ideas if we were to plan a 1 month trek across Europe. I know a few people, and I mean very few, that can, and will fly by the seat of their pants, scrounge enough money together to get there and have some chump change in their pocket only to figure the rest out once they get there, and I envy them. But for me, I’m a planner, down to the last detail. So for the rest of us with the responsibilities that keep us from spur of the moment adventures, we put a plan together, smart goal setting. We break it down into what needs to be done daily, weekly and monthly in order to make this great vacation a reality. Start with a little research on exactly where you want to go and what you want to see and do. Over the next few days, weeks and months, you will contact a travel agent, airlines, hotels, and whatever else will require planning and expense. Put a budget together with those expenses and then figure food, souvenirs, travel within and some extra slush money. Once you have a better idea of what the cost is, divide up the total funds needed and put together a monthly savings plan so you can enjoy your well earned vacation, a goal you set and achieved, without the burden of worrying about how you are going to pay for it. Use the goal setting worksheets and make your list. 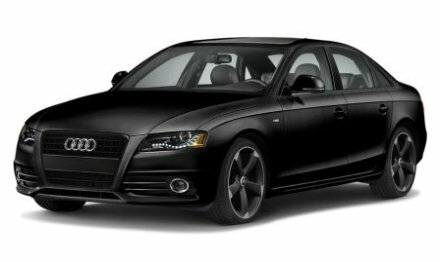 budget trains, taxis, car rentals, etc. You will notice that by writing out your goal setting ideas, all the things you need to think about in order accomplish your goal will start to form some order. But to be more specific in how you are going to accomplish these goals and the timeframes for which you need to accomplish them in, use the smart goal setting formula to help make sure no steps are missed. Print one of the Goal Setting Templates provided by GoalSettingBasics.com. Now with your goal setting templates in hand, take those goal setting ideas and use SMART Goal Setting to start organizing and prioritizing. This process will help you determine Specific, Measurable, Attainable, Relevant and Timelines that will guide you in reaching your goals. Specific - Be as specific as you can about your goal-for example-a general goal would be I want to travel to Europe- A specific goal would be I want to travel to Europe for 4 weeks between September and August 2014. I need X amount of money to do so. Measurable - Establish a means to measure your progress-for example-I need $4000 for my trip that is 10 months away, therefore I need to save $400 a month. One month from establishing these goals and for each month following, do a progress check and adjust as needed. 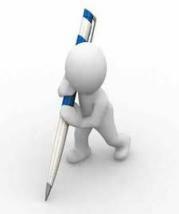 Attainable - When you identify a goal, write it out and make a plan, you are making an attainable goal. You will see opportunities arise that will help you in accomplishing this goal. You will develop a positive attitude working towards an attainable goal and you will develop traits that will give you the strength to see it through. Realistic - In my book there are no Dreams or Goals too grand, but you do have to be realistic. Make sure the goal you have set is something you are willing and capable of doing. When setting a lofty goal and challenging yourself you will find the reward that much better. Timelines - Creates a sense of urgency. Knowing you have to accomplish a task at a certain time makes you accountable. Know what those time lines are. What needs to be done by when. How much needs to be saved by when and take the steps necessary to meet those timelines. 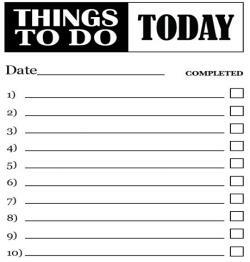 Make yourself a daily to do list to help keep you on track of the things you need to do. Check them off as you go. Not only will each check be a step closer to achieving your goal but an incredible sense of satisfaction. The last thing you do at night or the first thing you do in the morning is make the to do list for the day. Live by it and you will see progress. There will be days that you feel as you are not making any headway, that the goal setting ideas you have will never be accomplished. NEVER give up! We all have those days and you will make it through it. When those times come, and they will, this is where visual goal setting really helps out. Visual goal setting plays another important part of goal setting ideas. Visual goal setting has many definitions and can be considered as a thought or an action. Sometimes it is the Dream at the beginning, sometimes it's seeing yourself getting closer to your goal, it can be a picture of a material item, and sometimes it's seeing yourself there, in the end zone, on the beach, in the new car, whatever it is that motivates you and keeps moving forward towards your goal. Whether in written form or in the form of a picture, hang them where they are always in front of you. Visual goal setting is my favorite part of goal setting. I love to hang pictures on my wall of the goals I’m working towards. There is nothing like looking at the car, yacht, plane or home of my dreams or the white sandy beaches of my next vacation spot just hanging there in right in front of me reminding me every day of what it is I’m working towards. You should be looking at these goals every day, reminding you of what it is you are working so hard for and on those especially tough days when you wonder if you are ever going to make it, take a moment, relax, take a deep breath, look at what you have hanging there, the thing that is motivating you, VISUALIZE it, and before you know it you will feel better, refreshed, excited and you will be off again working towards that goal. Here is another one of my goal setting tips. This step is not for everybody but it is something I do often. When I have decided to commit myself to a goal, I make it public. I tell my family, my friends, heck, I tell people I meet on the streets sometimes about my goals. I do this for accountability. If I have told someone I am going to do something, then by golly, I better do it. It forces me to take action even when sometimes it difficult to do. A Personal Mission Statement is a statement that will describe your fundamental purpose. It's what you ultimately want to achieve in your life or career, expressed in a specific, measurable way. It will guide you in the planning and implementation of your vision. It’s a description that encompasses your own personal objectives and long-term goals. Be prepared to invest time, effort and sometimes short term sacrifices to achieve long term goals. My wish for you is that these goal setting ideas stimulate and inspire you to take the necessary actions needed in order for you to succeed in reaching your goals.